Recently, I was enjoying a beautiful lake day with my family, the sun in my face, the wind in my hair, the boat skipped gently along the water. Everything seemed to be going as it should. Until we heard, “Putt…putt…putt…putt…” And with a marina in our sight line—the boat ran out of gas. We sat dead in the water, baking in the hot sun, waiting to wave down a Good Samaritan to tow us in. Once towed, we discovered the marina was closed, our phones refused to pick up service, and we were forced to rely on yet another Good Samaritan to drive us to get gas. Our carefree lake day seemed far away as it began to rain. The expression, “When it rains it pours” is an apt description of our day. While my story is a literal story of running out of gas, I have encountered many stories of “running out of gas” from the loving and dedicated family caregiver. The expression, “When it rains it pours” can not only describe my lake day, but it can often be an even more accurate description of the average day in the life of a family caregiver. Maybe it describes your day and this feels like your story. Your time is spent managing two homes, two schedules, doctors appointments, therapy appointments, changes in your loved one’s health status, and so on. You, the devoted caregiver, continue on. Perhaps you hear the occasional “Putt, putt…” but you forge on. Maybe the marina is in your sight line, your respite is coming, you think you can make it. But, can you? What happens if you run out of gas? Running out of gas quickly required us to ask for help, there was no way we could fill our tank on our own. The truth is, asking for help is not easy. It can feel awkward or you may fear being an inconvenience, but sometimes asking for help is a necessity. 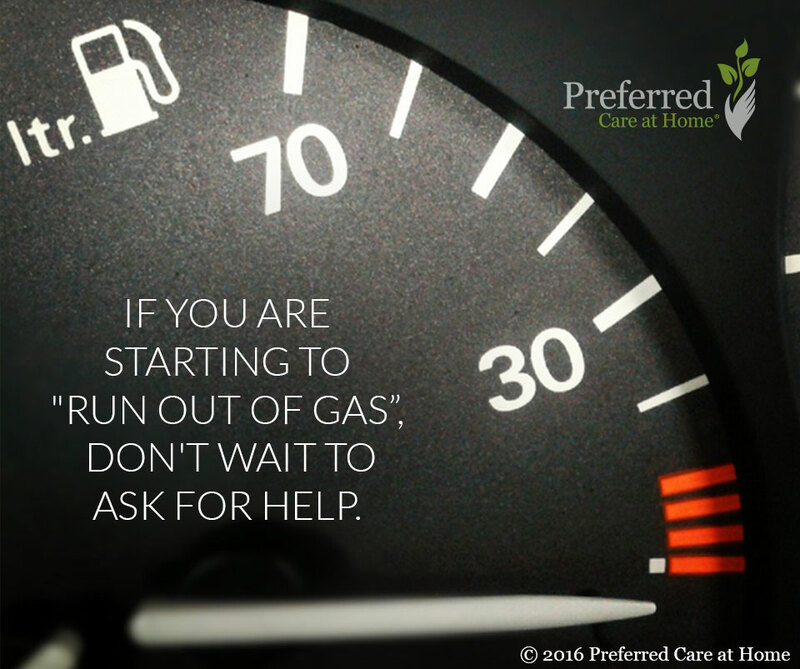 If you feel like you are starting to “run out of gas”, don’t wait to ask for help, get the caregiver support you need now. At Preferred Care at Home we understand the challenges that family caregivers face on a daily basis. We have the honor of coming along side families and providing the caregiver support needed to ensure they don’t “run out of gas”. Whether it’s one hour a week or 24 hours a day, our reliable, compassionate, and affordable services are here to help.